Add your link to any or all of the Social Media Follow Groups below! 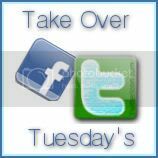 Follow as many people as you would like and be certain to leave a comment on their page to let them know you are a fan! Please be certain to follow your hostesses. Your presence and participation is appreciated and we will always follow you back! "I have a chaotic life that includes work, husband, 2 kids, and more pets than I care to admit. I am passionate about the environment but refuse to give up my high tech toys. I spend way too much on organic milk and local, grass fed beef but have a horrible Cheeto addiction and get quite agitated when there is no more diet Coke in the house."